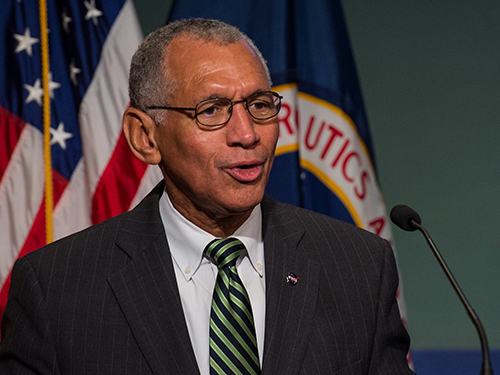 NASA Administrator Charles Bolden said July 30 he is not optimistic that Congress will pass a NASA authorization bill this year, and expects to start the 2015 fiscal year on a continuing resolution. On the appropriations side, Bolden said the increase in funding offered in the House bill over the Obama administration’s request “was a very pleasant surprise for all of us.” He added that he was “disappointed” the bill did not fully fund commercial crew, offering $785 million versus the requested $848 million, “but we’ll take it.” He added he was also concerned about cuts in the bill in the request for NASA’s Space Technology Mission Directorate. The Senate’s version of the appropriations bill provides similar funding levels, but has stalled out on the Senate floor because of unrelated issues. “There’s a strong possibility that the federal government could be funded through a continuing resolution for a period of time during fiscal year 2015,” Bolden said.